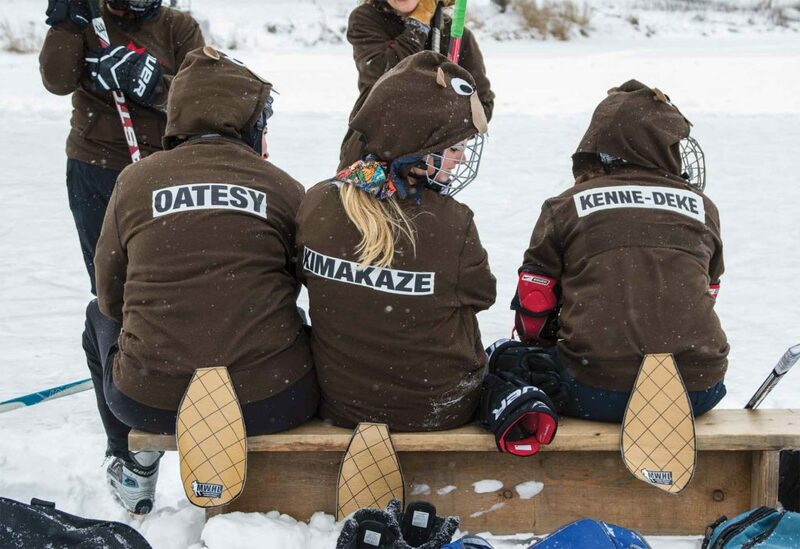 The first week of February is still months away but both Wade Holman’s and Kim Knight’s hockey teams are counting the days until the next Canadian National Pond Hockey Championship (CNPHC) tournament gets underway at Pinestone Resort near Haliburton, Ontario. There’s just something about playing the game outdoors in a natural setting that captures the imagination of hockey fans everywhere. The two-weekend tournament attracts up to 900 players on 150 teams every year. The tournament’s website (canadapondhockey.ca) describes the event as the purest form of hockey. It takes competitors, volunteers and spectators alike back to the roots of game amidst a breathtaking northern landscape setting. Four-skater teams with two substitutes play two 15-minute action packed halves on pint sized rinks. There are no goalies, no slap shots, no body checks and no fighting. Helmets are mandatory; wearing protective equipment is optional, but it’s highly recommended. The game moves at a frenetic pace on the smaller ice surfaces. They’re high scoring, pass-pass-shoot competitions without much stick handling. Collisions aren’t uncommon. While the rules are familiar to anyone who’s played a game of road hockey on a suburban street, participants swear there’s something special about playing on a pond. John Teljeur’s team of 100 volunteers often have to go to great efforts to make sure the ice stays in good shape through hundreds of games. “We play rec hockey twice a week in Oakville, Ontario,” Holman says. “It’s a fun social thing to do every week. Pond hockey, though, is a once-a-year event that we look forward to. Most of the guys I play with are in their forties but I think being out on the pond brings back childhood memories of playing on a frozen lake or playing outside in the winter. Even at our age, there’s still that nostalgia of playing on the pond; there’s nothing like it. Kim (Kimakaze) Knight, from Bracebridge, Ontario, played on one of the original teams in the tournament when it first launched in Deerhurst Resort in Huntsville, Ontario, in 2006. They had so much fun that the Muskoka Women’s Hockey League (MWHL) in which she plays and helps run has entered multiple teams ever since. She says it’s the best weekend of the year. Kim (Kimakaze) Knight says that MWHL teams try to come up with new creative outfits every year. 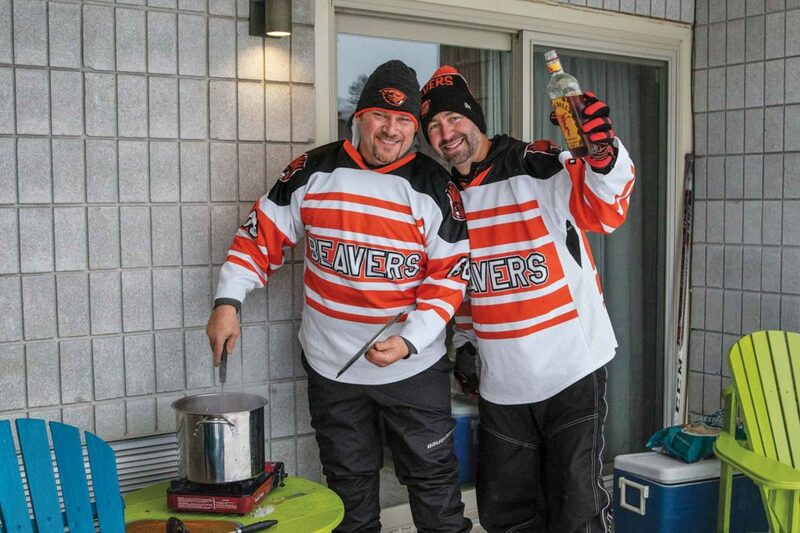 They were Canadian Beavers in 2018…all part of having fun with other hockey lovers. The CNPHC is so popular that it’s spread over two weekends. The first weekend is an open event for men’s and women’s teams younger than 35 years. The second weekend, the Masters, is for teams in the 35-plus age bracket. Both weekends have divisions for teams with a wide range of skill levels. The CNPHC is modelled after the World Pond Hockey Championships held annually in Plaster Rock, New Brunswick, says Teljeur. It’s one of between 100 and 120 similar events held across North America every winter. The events are subject to the whims of winter weather, so the actual number of tournaments varies from year to year. Wade Holman’s and teammate Cory Morel’s rec hockey league is sending three teams to the 2019 tournament. Battling the weather. Keeping 18 hockey rinks in pristine shape on a frozen pond through hundreds of hockey games is an epic struggle. Mother Nature has done something to keep the tournament’s 100 volunteers’ lives interesting every year Teljeur has been involved with the event. The next weekend started off brutally cold. Ice expands as it gets colder so massive cracks started to open up across the playing surface. 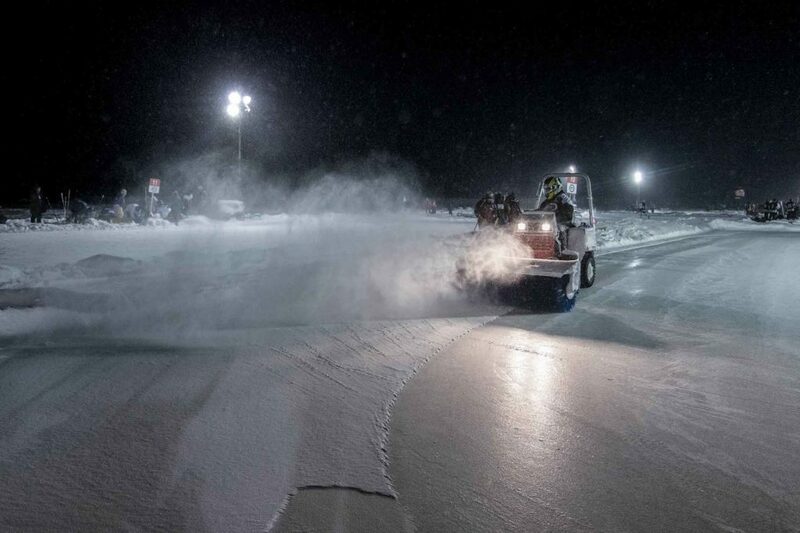 Teljeur’s teams spent Friday patching and flooding (coating the ice with water) to close the gaps. They hoped to flood the surfaces with firehoses to seal the ice after play wrapped up for the day. Unfortunately, their plans were disrupted by another heavy snowfall. Build your own. If you plan to set up a skating rink on a pond in your backyard, don’t take shortcuts when it comes to safety, Teljeur says. Start by picking a location away from any springs or moving water. It’s safe to take small equipment out on the ice once it’s six inches thick but aim for twelve. Do this by keeping your rink and the path to it clear of snow. Keep monitoring the thickness regularly, especially on a larger body of water, because it can deteriorate rapidly when temperatures change. You can smooth rough ice surfaces by flooding the ice with buckets of water or hoses. Use hot water if it’s an option because it freezes much faster and melts any snow, leaving a nice flat ice surface.